A well-maintained trail system from the Pantoll Ranger Station offers hikers and runners numerous routes through Mt Tamalpais State Park. The Alpine, Bootjack, TCC and Stapelveldt trails form a short loop through a comprehensive ecological cross section of the park in a relatively short space. The Alpine Trail crests a small ridge then tilts down a steep gulch away from Panoramic Highway to the Bootjack Trail junction (.35 miles : 1,270). Note young and old redwoods competing for space in these drier, upper-ravine soil beds with Douglas fir, oak, bay and buckeye. The Bootjack Trail shifts quickly through mixed forest past the Troop 80 Trail spur (.55 miles : 1,120') to the TCC Trail split on the edge of Van Wyck Meadow (.67 miles : 1,032'). Enjoy this sunny clearing before crossing over Redwood Creek on the TCC Trail. The TCC rises steadily beneath a tall Douglas fir and a varied understory. Big-leaf maple have adapted to low light by producing the largest leaves of any maple, while the bay laurel has developed a root system that enables it to lean toward better lit openings in the forest. Tan oak leaves are especially efficient in synthesizing dappled light. This complex community is critical to the northern spotted owl, found only in old-growth forests where the understory is sufficient to protect it from predation and competition. A winding climb continues to the TCC Trail - Stapelveldt Trail junction (2.1 miles : 1,248'), beyond which the grade steepens considerably on the final push back to the Pantoll Ranger Station. The Stapelveldt levels beside the Pantoll Campground (2.35 miles) and veers right, following signs for the Alpine Trail to complete the loop (2.45 miles : 1,480'). TCC stands for the Tamalpais Conservation Club. Alpine is a nod to the California Alpine Club - or Alpine Club Trail - who formed in 1914 and made this trail one of their first projects. Coast Redwoods are the tallest living organisms on earth and can live to be 2,000 years old. 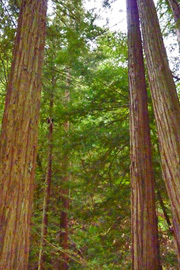 Redwoods grow best in moderate temperatures and need significant moisture to thrive. The Redwoods' success in the San Francisco Bay Area is due in part to year-round fog, which condenses on the trees' needles, drips to the ground and provides moisture, even during the dry season. Dogs and Bikes are not permitted on the Alpine - Bootjack - TCC - Stapelveldt Loop. Mt Tamalpais State Park is located north of San Francisco in Marin County. The Pantoll Ranger Station is 8.5 miles from Highway 101 on Panoramic Highway. The Bootjack Trail is accessed from the Alpine Trailhead, located steps away from the Pantoll Ranger Station (to the left).